NAPLES, Florida (AP) ― Stacy Lewis has never been closer to a $1 million payoff, in points or in person. Lewis is leading the inaugural “Race to CME Globe” that will be decided this week in the LPGA Tour’s season finale. The top three players ― Lewis, Park In-bee and Lydia Ko ― need to win the CME Group Tour Championship to capture the $1 million bonus. In a promotional stunt Wednesday, the tour asked them to pose next to a glass case neatly packed with $100 bills that amount to the richest payoff in women’s golf. Lewis wouldn’t touch the glass case. She just couldn’t. “I don’t even want to think about it,” Lewis said. The LPGA Tour has never had so much on the line at one tournament, an ideal conclusion to one of its most dynamic seasons. Park goes into the final event of the year at No. 1 in the world, but not by much. Lewis is leading the race for LPGA player of the year, but only by three points. And her lead over Park in the Vare Trophy for the lowest scoring average is even thinner ― just under one-hundredth of a point. Park or Lewis can sweep or share all the significant awards, and while the math can get a little complicated, the solution is simple. The Race to CME Globe is similar to the FedEx Cup on the PGA Tour, except the numbers are easier and the payout substantially smaller. The points have been reset so that the top three players have to win the tournament to capture the bonus, and only the top nine have a mathematical shot at the $1 million. Karrie Webb is holding down the final spot. Webb would have to win and have Lewis finish out of the top 40, so it’s a long shot. Much more compelling than cash are the awards. Lewis has a three-point lead in LPGA player of the year. Her scoring average is 69.476, compared with 69.571 for Park. U.S. Women’s Open champion Michelle Wie is not too far behind at 69.795. 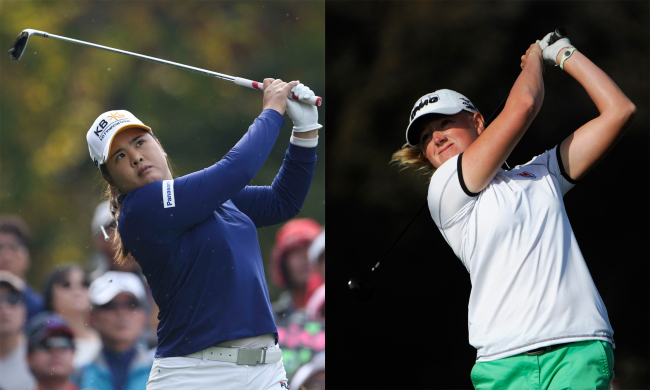 Depending on the scoring, this could be the first time the LPGA Tour has four players with a sub-70 scoring average. Lewis looks to be relatively safe to win the money title with a lead of nearly $300,000. Park would have to win to surpass her. Lewis has a chance to become the first American in 20 years to win the Vare Trophy, player of the year and the money title. Beth Daniel swept them in 1994. The advantage might fall to Park, who recently replaced Lewis atop the world ranking and has nine consecutive top 10s. Lewis has slowed considerably in the second half of the season, with only four top 10s in her last 12 tournaments. It was so much easier on Park a year ago. She wrapped up player of the year before arriving to Florida for the season finale. She delivered a moving acceptance speech at the awards banquet during the tournament. The whole week was one big celebration, even though she didn’t win. She didn’t have to. “This could be a little bit more fun,” Park said. The most simple explanation was offered ― win the tournament and take home $500,000 for the victory, $1 million for Race to CME Globe. No woman has ever won $1.5 million in a single week of golf.